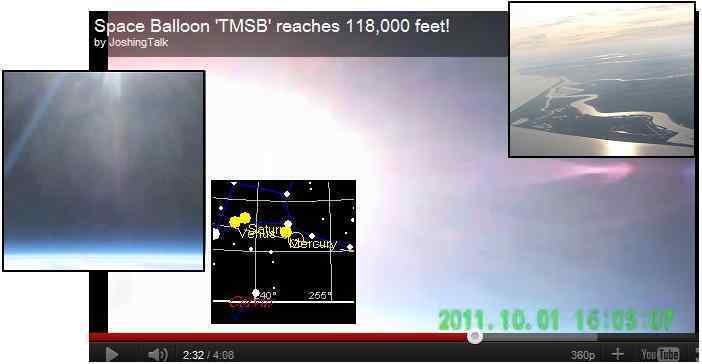 Some months ago amateurs sent a homemade balloon into space and got a capture of Planet X and this covered by the Zetas. http://www.zetatalk.com/ning/26ju2010.htm Some other amateurs have now replicated this again, it shows the sun for a brief second at 2 minutes 32 seconds. Is this a capture of Planet X? http://www.youtube.com/watch?v=pQgOLshCFN0&feature=player_embedded Surely it is only a matter of time before someone gets an excellent capture using this method. The establishment must be getting very nervous about this and there is nothing they can really do to stop it! [and from another] Home-made £200 weather balloon camera captures the Thames from 118,000 feet up [Oct 13] http://www.dailymail.co.uk/sciencetech/article-2048244/Home-200-weather The home-made rig was made by Josh Taylor, 21-year-old website designer from Guildford - entitled the Taylor Made Space Balloon. It captured images from 23 miles up in the stratosphere. Indeed, while at a high altitude and in a tumble so that the Sun was briefly visible, this balloon camera captured evidence of the presence of Planet X. The establishment will ignore this just as NASA and the establishment has ignored evidence of the presence of Planet X on their SOHO and Stereo images, ignored evidence of the magnetic presence of Planet X on the magnetic simulator charts, ignored the daily global shuttering on the USGS live seismographs which show the magnetic grab and push against the Earth which also causes the Earth wobble, which they are likewise ignoring. The Moon is not where it is supposed to be? This likewise is ignored, as are the signs in the skies, the many UFO mass sightings, and the increasing red dust in the atmosphere. The linked story below discusses the fact that a computer virus that copies every keystroke has infected the US military's fleet of drone aircraft and software. The story explains how these drones are now the US military's preferred way to fight wars - with unmanned drones flying over enemy territory and bombing or spying ..... with the pilots all safe and secure in the Nevada desert. Two weeks ago, the drones and their software were infected with a computer virus that copies every keystroke made by the drone operators. They think the virus is benign, because it has caused no damage to the drones or the servers and the only thing it does is copy the keystrokes. The interesting/troubling part isn't just the question of how the computers and servers were infected (no one knows), it's the fact that the military computer scientists keep removing the virus and it keeps coming back! http://www.wired.com/dangerroom/2011/10/virus-hits-drone-fleet/ My question is this - Is this situation (the virus and it's continual reappearance) solely the work of humans? Or has the Council of Worlds given it's permission to the various benign aliens that are currently helping with the Transformation to assist the human/humans responsible? I can certainly see how a record of the keystrokes of these drones could be used to help put pressure on the US to end its aggression in the world should a copy be made public. Also, I could easily see the elite using these drones to spy on the public's movements, etc. just like a satellite. I could understand the COW approving assistance if this was the case. Clearly this infection was caused initially by the many peace advocates fighting the military and fighting the drone program specifically. Keystroke captures are nothing new, used for identity theft and password theft and the like. What seems to be new is the resistance to removal that the military is experiencing. Mankind's electronics are easily interfered with, primarily by simply shutting a function down by removing an electrical impulse so a shutdown occurs. But how would a virus be reinstated after removal? As is well known, at least among contactees, is our many means of maneuvering in human society. Screen memories, temporary future travel to affect a future scene that will click in when the time arrives, and temporarily freezing all in a room so a maneuver can occur are some means we have explained. The virus is reinstated after removal, deliberately. What would the implication of an alien assist be? Just as the shuttle Columbia was taken down in a dramatic fashion to warn the establishment about continuing their program of peeking at Planet X while failing to inform the public, the drone virus is a warning. Recently an unmanned Russian supply shuttle blew up for the same reasons, as activity at the ISS should likewise cease. Key stokes can be used to expose and embarrass the US military in their continuing wars protecting American interests, which are of course wars protecting corporate and special interests. It is likewise a warning of potential future interference if the drones are used by the establishment to enforce slavery of survivors, or track migration of survivors after the pole shift. The message has not been lost on the US military. As Planet X comes ever closer toward earth's vicinity, we are bound to have more Earth-related red-orange dust sightings, news stories and questions. But what about Planet X tail dust on the Moon? Historically and generally with Planet X passages of earth, what happens to the composition and color of the Moon's surface when/after the tail of Planet X wafts over and "licks" the Moon? During the upcoming run up to Planet X's passage, will Earth's humans often see a red-orange tinted Moon only because Planet X's tail dust is wafting in space in the Earth and the Moon vicinity? (And/or bent light rays bouncing off the red-orange PX tail and thence reflecting off the Moon)? Or will we increasingly see a red-orange colored Moon because Planet X's red-orange dust has "licked" the Moon and the PX dust stays on the Moon's surface as a new layer of lunar regolith? Also, with all the accumulated red-orange dust from many, many dozens of previous Planet X passages and "licks" of the Earth and Moon, why doesn't the Moon exhibit more red-orange dust on or in the lunar regolith? Micrometeorite vaporization? Reference: ZetaTalk Explanation 1/11/2003: http://www.zetatalk.com/newsletr/issue177.htm The red dust cloud evolved as many planets in the solar system are heavy in this element, Mars, for instance. There are portions of the Earth that exhibit a red clay soil, Australia and the Southeastern US, but this is not a native soil as much as an accumulation of deposits". The Moon is not a magnet, not magnetically charged as is the Earth. Thus, when the tail wafts over the Moon it clings rather to itself, the tail. When the tail wafts over the Earth, it clings to the Earth. Thus there are places on the Earth's surface where red soil, layers of red dust in the soil, appear, but the Moon does not take on this red hue. Political paralysis will increase as the Earth changes increase, the old familiar approaches to solving problems inadequate and politicians on all sides of the political spectrum clinging to what they know as there frankly seem to be no easy answers. Despots will get more dictatorial. The wealthy will cling to their assets more tightly, with more rules to protect from looting, their great fear. The ultra-right will look to more police crackdowns and more prisons, elimination of those they think of as unworthy. Churches will preach that love is the answer while speaking of their particular flocks as inclusive, worthy, with the rest of mankind left behind. And the liberals will demand that more assistance to the homeless and jobless be forthcoming, at a time when all government coffers seem to have run dry. Seeing the crumbling infrastructure, increasing food shortages and starvation, and signs in the skies the public will demand to know what is happening to the globe. Paralysis will set in among those expected to lead, due to conflicts among factions. It will not just be conflicts along the old lines, the class warfare lines or the wealthy vs the poor, though these will still prevail even as the hour of the pole shift descends upon mankind. There will be new conflicts too: which neighborhood should be served first by infrastructure repairs; what corporate building should be confiscated to house refugees; whether the military should be used to rescue people or guard against looting; and what government account should be raided to pay for feeding people in tent cities. Paralysis will become the norm, leaving the citizens to fend for themselves. In China, a shocking story has emerged of a little girl, Yueyue, who was wandering close to her home when hit by a van. The little girl was seriously injured and the van...drove on. This could be considered to be just another isolated case of a hit-and-run but, the little girl, lying comatose on the road is run over again, and again the vehicle continues on regardless. A total of 18 people cycle, walk or drive past the broken body of this poor toddler. Eventually, a rag collector drags the poor child's body to the side of the road and frantically runs for help, only to be repeatedly told to "mind your own business". Eventually, the child is declared brain dead. So Sad. Per the Zetas: http://www.zetatalk.com/index/blog1024.htm "China Man was developed to offset the ruthlessness of the inhabitants of [Planet X], who interbred with humans during their mining operations. The Oriental is slight, and given to ponder and consider the feelings of many before proceeding." Would the Z's care to comment on this? Are the Chinese populace being steered toward STS, as a symptom of the oppression they have suffered for so long? Perhaps even exacerbated by soul knowledge of what is coming? Could we expect to see an increase of this STS behavior as the Shift approaches elsewhere? [and from another] http://www.theaustralian.com.au/news/world/china-shocked A man who identified himself as the same driver told local media: "If she's dead, I may pay only about 20,000 yuan ($3200, but if she's injured it may cost me hundreds of thousands of yuan." Both drivers have since been arrested. Many remember a case in 2006 when a 65-year-old woman fell in the street and broke her hip. Peng Yu, 26, rushed to help, took her to hospital and gave her 200 yuan for good measure. She later sued him, winning an award of 45,000 yuan because the judge decided that Mr Peng's gift was evidence that he had caused her fall. Since then the fear of litigation has increased. In June, last year, a man helped an elderly woman only to be sued for 100,000 yuan. The Communist Party's official newspaper, the People's Daily, subsequently conducted a poll that found that 80 per cent of people would not help an elderly person in the street for fear of extortion. On occasion dramatic evidence hits the media of how far the average person will go to protect themselves from repercussions. In New York city a woman was stabbed to death, screaming the whole time, without a single person peeking out their apartment windows or even dialing 911 - the Kitty Genovese incident. Without question, the public turned away and did not lift a finger. That this type of callousness happens every day is not often documented, as it often requires a video or surveillance cam, and a blatantly insured and dying person as the victim. Most cases, which are more common than not, do not involve witnesses. We have stated that out of the 6 billion plus humans on Earth, that only about a billion have incarnating souls, and of these only about 30% are Service-to-Other, good hearted. Another billion are incarnated at present by Star Children, Service-to-Other all. That leaves the vast majority as unsparked souls, or undecided souls, or those souls who have chosen the Service-to-Self path. What is the process by which an immature soul is presented with a dilemma, to save himself from involvement or to get involved out of empathy, and makes the decision to not get involved. For those who have not developed their sense of responsibility, based on empathy, to a sufficient degree, the decision is simple - do not get involved! Involvement means blood on one's clothing, questions by the police as one is at a minimum considered a witness, and possibly a mandatory court appearance. In the case of the China child, recent court decisions to fine and punish the Good Samaritan added yet more reluctance. There have been cases in the US where someone trying to save a life via CPR was later sued for the person's death. In the Kitty Genovese incident, the fear of being identified as a witness, the one who made the phone call, included more than court time as a witness, as the man who returned repeatedly to stab Kitty could someday try to take revenge. For most, the undecided souls or unsparked humans, it takes little more than this to defer their involvement. My question is regarding the 7/10 progress. It seems clear what has happened over the last week or so in Thailand. It looks like the Thai govt/authorities panicked and pushed out their situation to the mainstream media, as around 75% of the country is underwater. Since then, it seems the situation has been walked back a bit, with the media essentially saying, "don't worry, the floods are receding, but may linger for 50 days". 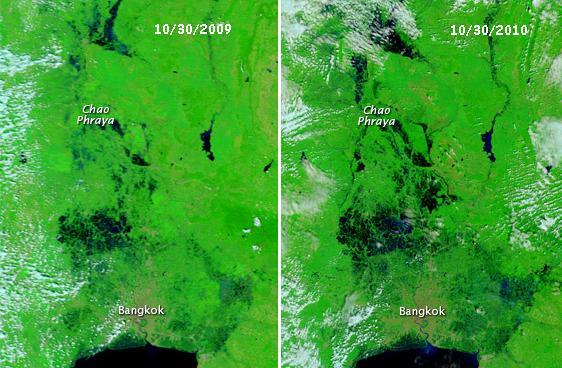 When you add in the flooding in Cambodia and Vietnam, this is an area larger than California that is flooded. There is no way to account for that much water by rainfall alone. This area affected is only supposed to drop 30-40 feet, and yet we aren't seeing the areas South dropping yet, like Indonesia. I understand the analogy of the "doorframe holding the door in place", so does the action we're seeing in Thailand, Cambodia, Vietnam signify - "the doorframe breaking" and final phase of Sunda sinking about to begin, or is this just more plate undulation? The sinking of the Sunda Plate is not yet complete, despite the flooding in Thailand which has the residents of Bangkok almost hysterical. We described an accordion effect on the Sunda Plate, where it was pressed from the side as well as pushed down under the curve at Sumatra and Java. 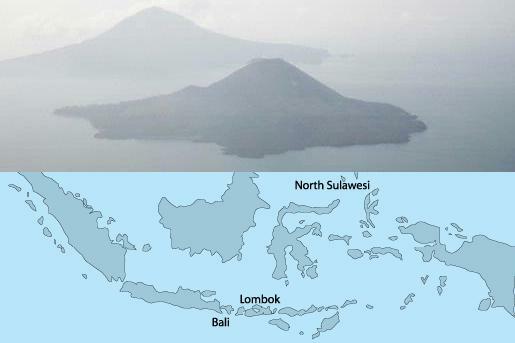 Even before Java began sinking, Thailand was in an accordion fold that lost elevation, experiencing worsening floods, while a new island near Bali popped up. This region near Bangkok appears to be reaching the 40 foot elevation drop we predicted, but this is deceptive as other parts of the Sunda Plate have not yet completed. Luzon, the northern island of the Philippines, seemed exempt from flooding in January, 2011, though by July 10, 2011 had started to participate in the sinking the rest of the Philippines had been experiencing. Suddenly, by September 4, 2011 Luzon was under water, and this is worsening. We have mentioned that though Luzon appears to be on the Philippine Plate, this is a land mass attached to the Philippines on the Sunda Plate because underlying rock strata hold it to the Sunda Plate. It will not sink while the Philippine Plate folds. Our description of the progress on September 17, 2011 has not changed much, though the Indo-Australian Plate has lifted on the New Zealand end, grounding the cargo ship Rena, and sinking on the Sunda Plate has intensified. The world is beginning to take notice, despite the blackout and excuses provided by the cover-up artists. Where this all seems to be taking place gradually, sudden acceleration can occur. Do not be lulled by seeming delays. Indonesia has brutally suppressed any independent journalism reporting on the stagnant floods in their country, as has Malaysia. The governments in Thailand and the Philippines are more humane, and allow their press more freedom. Despite today's arrogant claims of the US about the capture and killing of Gadhafi in Libya currently broadcast in all western media, it appears to many another staged psyop http://libyasos.blogspot.com/2011/10/muammar-al-gaddafi-is-alive.html similar to the 2003 Saddam Hussein's fake hanging http://www.zetatalk.com/index/zeta346.htm or 2002 Bin Laden's death http://poleshift.ning.com/forum/topics/zetatalk-chat-for-may-7-2011 In both cases, the Zetas have promptly countered the then rumors that they were dead. Is this latest capture and death of Gadhafi legitimate? The death of Gadhafi was the culmination of a hunt by a large majority of the populace of Libya, and not faked. Gadhafi, by his own testament, did not wish to leave Libya. He and his sons feared being turned over to prosecutors if they sought asylum in other countries. Even Venezuela looked shaky, given the current health of Hugo Chavez. In the heat of battle, finding an exact double of Gadhafi is not only unlikely, it is nearly impossible. The capture was recorded on a cell phone video. This was not a staged and well controlled scene, as was the supposed capture of Saddam and his sons. Saddam Hussein and his sons were clearly doubles, as an examination of their facial structure and features showed. Western powers stood to gain from this strongman's death. The Bush administration wanted Saddam dead, to claim success in their war efforts, to cover the truth about the war which was that it was an oil field grab. Saddam and his sons had gone into hiding and would not benefit from a public appearance, so his "death" was a safe move. Bin Laden's death, clearly a western op, could have been faked for the political benefit, but was not, as we stated. Where most of Bin Laden's videos and pronouncements were faked by the CIA, there was always the danger that the real Bin Laden would come forward, and thus his capture was never previously claimed. Pressed during an election year, Obama made a bold move and was rewarded. The evidence was substantial, and showed to numerous intel organizations around the world, as well as Republican senators. Where there are those who will always say he is still alive, the evidence was overwhelming and the witnesses too numerous for a serious challenge.